I thought we’d try something a little different today. I’d like to take you on a year-long journey of how simple Valentines ideas, a little bit of love and a whole lot of kindness can evolve and grow into something truly beautiful. We’ll begin about this time last year. Funny enough, we have just finished all being sick in my house and this same time last year we were all very, very sick. My son had pneumonia and we all went round and round with a bad stomach bug. It can be hard to keep things positive when dealing with a house full of sick people. 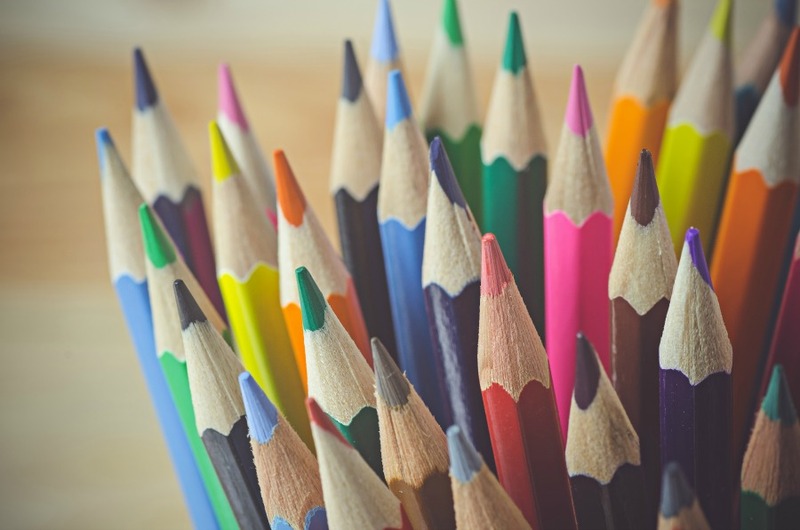 I try to keep things as cheerful as I can by baking wholesome treats and pulling out very simple art projects the kids can do while sipping some juice or water when they have a bout of energy. I remember laying out these doilies. I picked them up at the dollar store and just knew they would make beautiful Valentines. Adding watercolor to doilies is one of my all-time favorite art activities. They always turn out gorgeous and these heart-shaped ones are no exception. 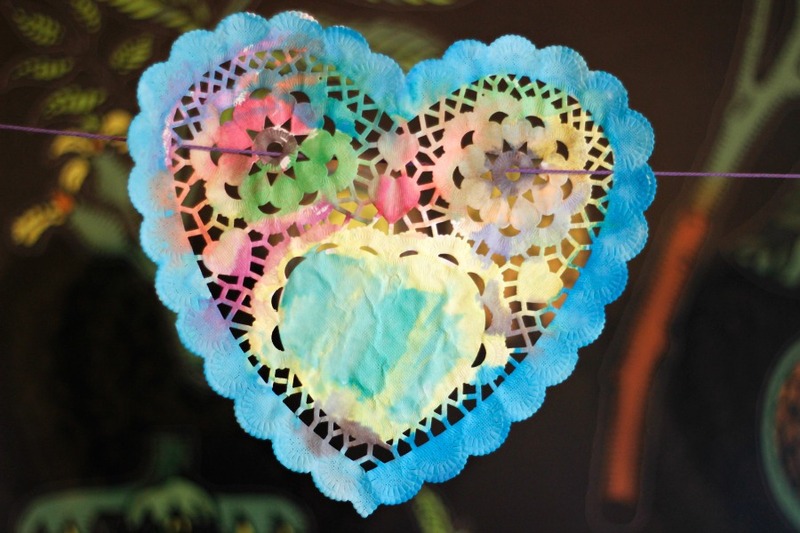 The kids were thrilled with how the colors seemed to be instantly soaked up by the doily and spread across the page. 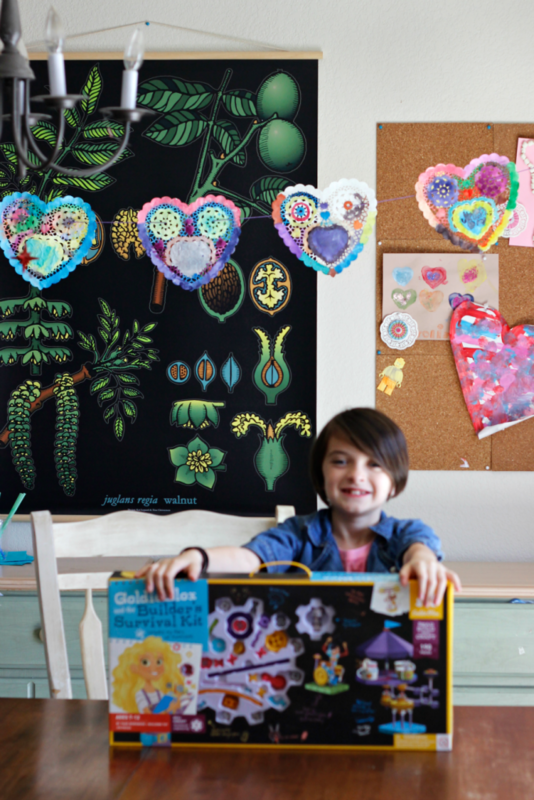 It’s a very gratifying project for little ones since they can see the result of your efforts so quickly. We set up a revolving system and painted lots of them in no time. 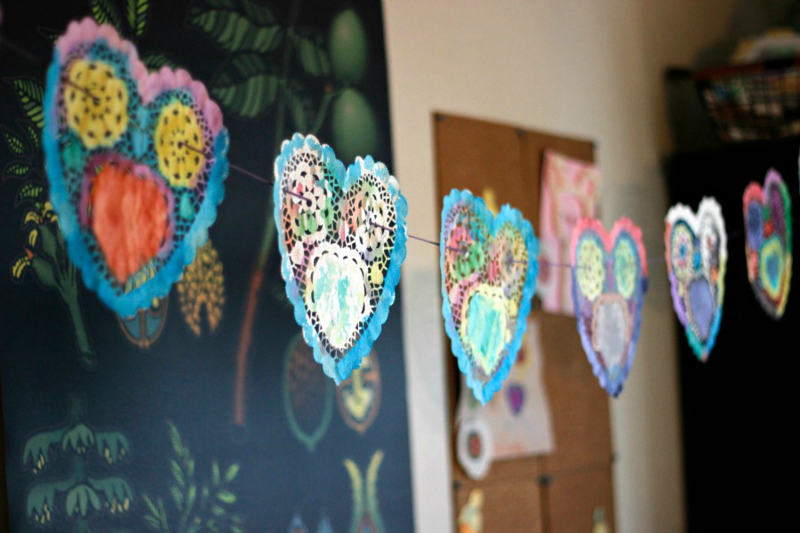 Once they were dry we had dozens of beautiful handmade heart-shaped doily Valentine’s to give to the people we loved but lucky for me we also had plenty left over to get creative with! I knew right away what I wanted to do with them. I grabbed some bakers twine, thank you Target dollar aisle! and got to work stringing them together. I had this vision in mind to use them as a garland to decorate our living room for my daughter’s birthday at the end of the month. but the garland was so pretty and we had so much time invested and memories now surrounding it I just couldn’t stand to put it away. About this time, Kelly and I were starting to talk about the #howidonatelife project (which you can still totally participate in!!) and about her family moving into a new home. I knew the next stop for this art project would be a trip to New York to cheer up a friend going through a tough time and to add a little sunshine and color to her new space. I delivered the garland to her while at Altitude Summit last week and I can’t wait to find out what happens to our simple Valentines idea next. 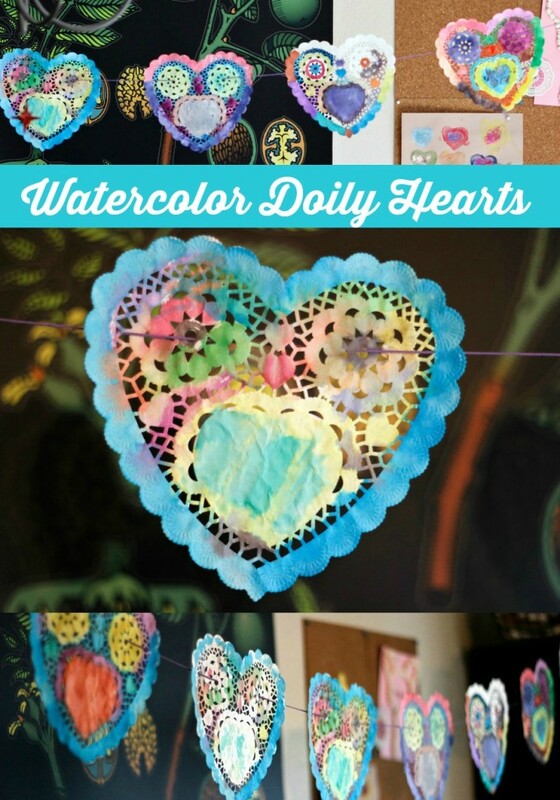 So a quick recap for you, this one watercolor heart doily ideas has provide countless hours of love, kindness and happiness to our family and is now making it’s way to a new one. 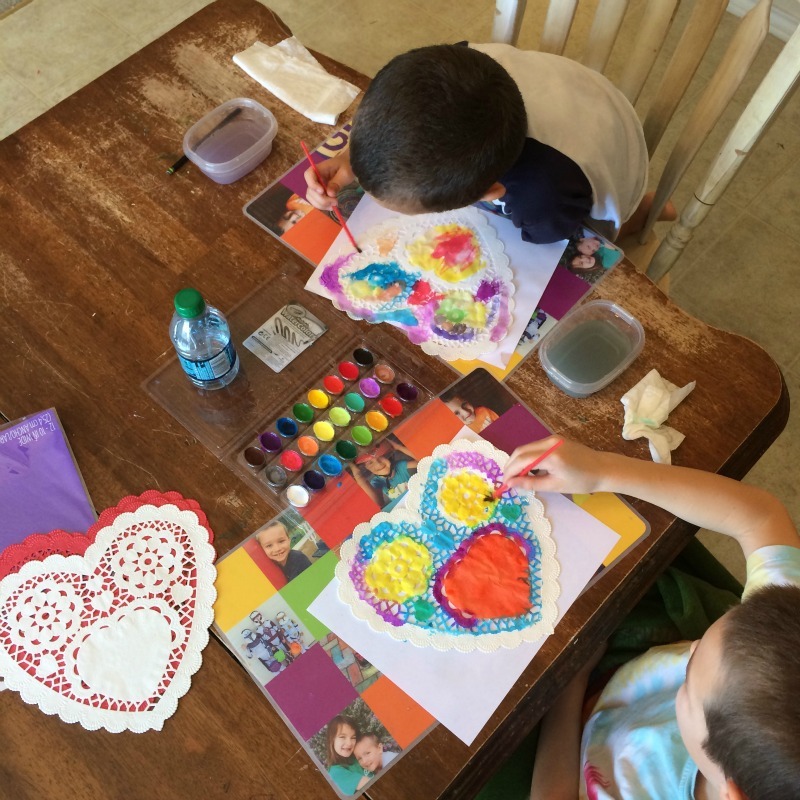 First, it was a sick day art activity that gave my kids hours of creative enjoyment and a nice pick me up when they were feeling down. Who knows where it will end up next! Have you every done a simple project that ended up bring tons of happiness to you and folks around you? Please tell us all about it! We want to keep sharing the love and spreading kindness across the web. 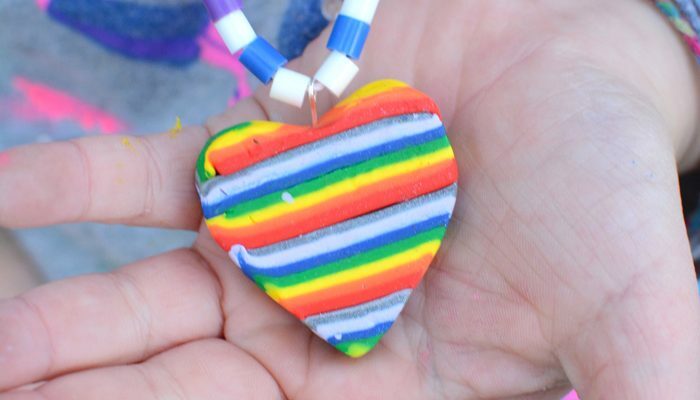 Need more ideas for acts of kindness you can do with your kids? 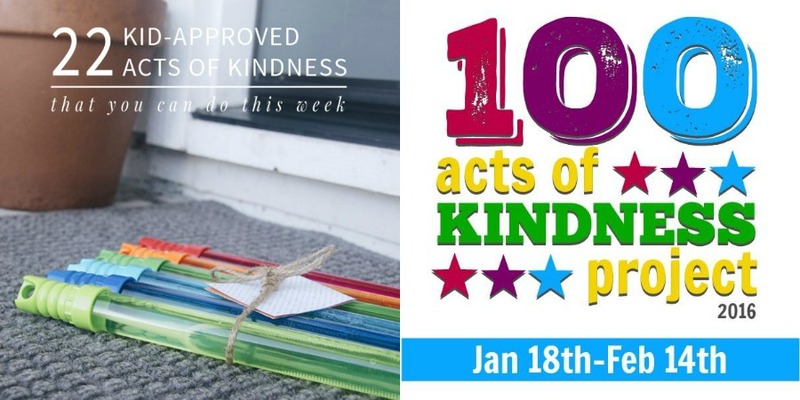 Check out last year’s post, 22 acts of kindness you can do with your kids this week then head over to take a look at the 100 acts of kindness series my friends Megan & Kristina host every year. TONS of ideas and inspiration for you there.